A lot of people will send Christmas cards to the military, and if they don’t know anyone, they will send it to “Any soldier” (or sailor). However, some facilities are overwhelmed by the process and are unable to deliver the cards. the Walter Reed Army Medical Center, where most wounded soldiers are cared for, has long accepted letters or parcels addressed to “Any Wounded Soldier.” No longer, mainly because of the huge amount of it. Over a million pieces a year, most of it during the holiday season, are sent just to the Walter Reed hospital. 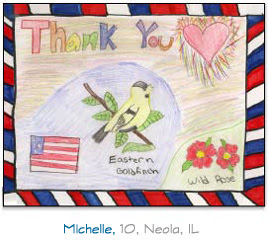 You can pick out an ecard, and they will arrange it to be sent to someone in the Military. If Whoopie Goldberg can send a card, you can too. Nancy Reyes is a retired physician living in the rural Philippines. Her website is Finest Kind Clinic and Fishmarket. She has a son in law stationed in Iraq. 1 user commented in " Send a Holiday greeting card to those Serving in the US Military "
I know that we are sending cards for the recovering soldiers now. But where do we send cards during the year to bring them some cheering up?